iPhone applications and vacation. Funny how they can end up coming together. 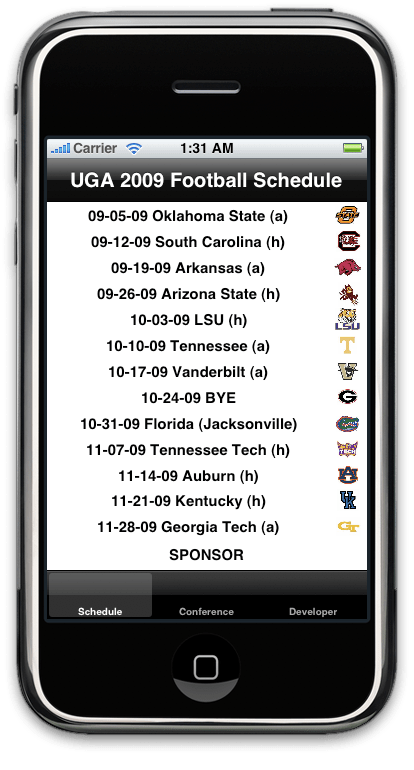 Another app I’ve been working on is a little football schedule for the UGA Bulldogs, which if you’ve been reading this site for awhile you’ll know is my team of choice. So here are some screenshots for the app, which should be up on the App Store once I get all the details worked out. Georgia won, but barely. In a 42 to 38 win over Kentucky, Georgia could have looked better. Maybe it’s being out of the National Title hunt, or maybe it’s just that Kentucky is a dangerous team. Kentucky is not bad this year, but haven’t managed to beat a ranked team yet. In a 52 to 38 win Georgia knocked off the 13th ranked team in the land, the LSU Tiger, ending any shot that LSU had at a national title and increasing their own. The BCS ranking now have them listed 6th in the nation after that win. Next up is the Florida Gators in the annual showdown in Jacksonville. Given that 2 teams ranked above Georgia are playing this weekend, a win against the Gators would put Georgia back into the top 5 with the potential of a national title ahead of them. 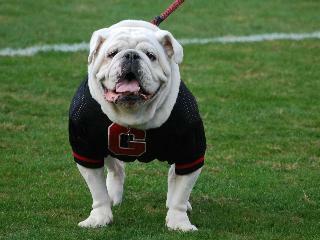 #10 in the nation, UGA hang on this weekend to knock off #20 Vanderbilt, 24-14. Vanderbilt put up a good fight until the end. The first release of the BCS standings comes out on Sunday and Georgia will certainly be somewhere in the top 10. Next weekend the Dawgs take on #13, LSU and shortly there after get #8 Florida. If the Bulldogs can hang on to win the remaining games on the schedule then the SEC Championship game will likely net a rematch between UGA and #2 Alabama, who shot up the rankings when they won the game the first time around. After taking the game into OT last year, the Dawgs simply couldn’t stop the Tide in the first half. We cleanly won the second half, but just couldn’t overcome the hole we dug ourselves into early in the game. They beat us at the line. Clearly the O-Line needs work. You see, football is a game often won or lost at the line of scrimmage. This sets up the running game by providing blocks and therefore running lanes or it provides the quarterback with the time needed to make passes. The Alabama line won this game. 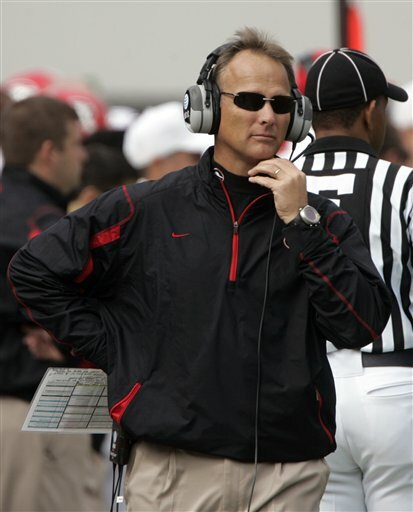 All the rest of the team had to do was basically not screw up… But as a consolation, at least UGA looked good in black!